Our first time at Greenford this season playing our third match. Our opposition is basically a Jewish team based in London Colney area that also play friendlies throughout the season, they are the product of two former teams and we have played against many of them before. As well as the 11 players, there were a couple of wives and there were children aged under 11. Mahender won the toss and elected to bat first. Openers today were Niroshan and Sam, Sam had been told that to justify high up the order he had to have a productive strike rate and there was plenty of “encouragement” from the sidelines all the way from when he faced the opening ball against Dushan who has Romanian background. He soon escaped strike with a run off a wide but soon back and his first account was a splendid 4. Tall Yair was the second bowler and there were wild no balls and wides to start and then the bowling settled down more with Niroshan taking Yair for 4 and a steady build to have 69 at 14 overs. In the third over from Avi, it seemed like the ball was blocked but it found the wicket and Niroshan having made use of strike was gone for a useful 30 but Sam was not so far behind with 21. Newton was next in and made his intent clear. Adam gave way to 14 year old Jamie who was impressive for 2 and half overs but Newton took him consecutively to the flags with no mercy. Avi meanwhile was very steady and on return from drinks he took a fine stretching catch from his bowling to dismiss Sam who had reached 25. Dom and his defensive style was his replacement. After some bowling from Josh, Yair returned to bowl opposite John and was on far better line and so at the end of the 30th Newton moved across and was LBW the next ball faced after we had cheered his 50 from 39 balls in under an hour. In this 9 Over spell Dom was up to 8. Mahender was now in and after a couple of slow overs was soon striking out but was bowled by Dushan for 22 in the 36th and meanwhile Dom had risen with some fine sweeps to 27. With the score at 189 we expected Manish to soon take it past 200 but surprisingly Adam got through his guard on the first ball. Scott replaced and both he and Dom took the score swiftly to 214 by the first ball of the last over. Dushan bowled and Leonard Cohen took an excellent catch at short Midwicket to send Dom back on an entertaining 36. Asad went in ahead of Mamun with buccaneering intent, sent a great drive and was running for an easy two. Granted it was a good fielding return but sideline consensus was that he was easily home but Square Leg Umpire Sam gave him the finger. So up to Mamun after all, his next ball was not seen by scorer as someone was leaning on the rickety table causing mayhem and there were several gathered who knew nothing so a dot ball assumed. On his second ball he was Trapped LBW so another walk back to be replaced by Yousuf who ran on a wide. Scott passed the strike back so another strike going for a two bizarrely led to another run out, not so contentious. All this frenetic activity meant Matthew who replaced unwell Sid was incompletely padded so as last due ball off strike Mamun went in as a runner and beyond all belief, Scott was run out for 15 on that last ball. By now Mamun was back and was able to highlight the unseen ball was a long stop boundary off a no ball. This took the final innings total to 222. A challenging target. And incredulity that five wickets went in the one final over to make us all out. Tea was a pleasant affair with more varied selection than many past occasions and shortly after 5pm the defence started. Wicketkeeper was Scott first half and Niroshan second. Newton opened and the strike passed from Mr Bean to Andy through a bye. A single keeping the strike as Asad came accurately from the other end to commence with Maiden. Newton then parried with his Maiden. Asad upped the ante by trapping Andy LBW so it was 2-1 in 4th. Josh escaped quickly with a run on wide but could not sustain a full Over from Newton who bowled cleanly before he could score. Mr Bean almost doubled the score with a boundary off Asad but fell with a fine catch behind off Asad next over, there had been another Newton Maiden meanwhile. Lenny and Dushan were now in but Lenny could not handle the pace of Asad and was bowled for no gain. Asad and Newton finished six Over spells with Maidens to have 10-2 and only 2-2 respectively. They were in trouble at 14-4. Dushan tried to repair the damage but Manish got his palms to a ball from Bob Luder off his bowling and their umpire sent him home at 5. In many a match the rapid release of ball would be deemed a dropped catch but the Umpire Andy calls. John and Dushan now steadied against the bowling of Manish and Mamun and even scored six off each. Yousuf and Matthew were the next pair to bowl and a fumbled recovery led to one of the boundaries against Yousuf. On Matthew’s third ball he got the prize of a clean bowling of Dushan for 46 and he followed this up on the third ball of his next over by taking Avi for two. Surprisingly although valid, he was not really content with the flight of the ball. Tall Yair strode in and being close to the opposition I can report there was not a lot of expectation. How wrong they were as Yair and John powered a 62 partnership before Mahender having left himself as last bowler giving both Sam and Dom exposure took Yair for a fine 29. To finish the Over he also had Adam for a Golden Duck as he hit wicket. Dom had bowled four overs with clarity only yielding 22 and Sam now partnering Mahender tightened up after sloppy first to end on 15 for five overs including 2 Maidens. Matthew was 19-2 in 4 and Yousuf 23 in 3 with Dushan having hit a six off a high no ball just before he was terminated. Manish was 22-1 off four and Mamun 28 off 5. Young Jamie was the last in and although his father Andy was umpiring there was was only fair decisions. 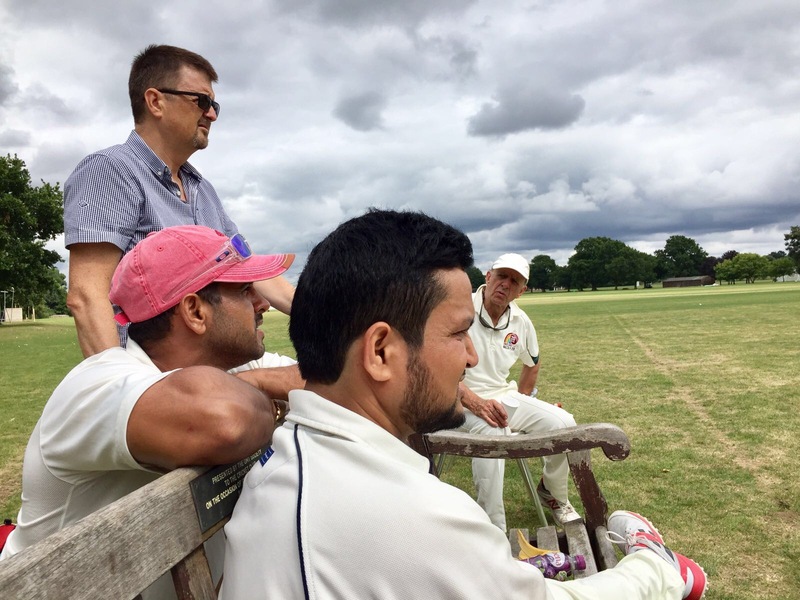 Asad had teased that he would return for a final spell but it was five overs including the mighty Mahender which is not to be relished and Sam and despite a lot of crowding fielding he took two separate singles off Mahender as he finished 14-2 off 3. They finished on 160 – 62 runs short with a finish expected long before the shadows had gotten long but those three late middle order had stemmed the romp and given our commanding lead, Mahender ensured the red ball was felt by most. John by the way finished as Match top score of 53. It was time for our Man of Match award as we packed up and with a 50 and 2-2 it was deservedly Newton. During the match the children had sometimes commented loudly on the scoreboard, as they often do, their unguarded comments were quite funny. This was a good natured match and we have set them a target for whenever we next play. Next week we are off to Herne Hill and Alleyns Ad Hoc. A delightful Ground and pavilion and always genial hosts. Please give availability to Mahender for three matches ahead as this helps rotation if there is any surfeit of resource. Before I sign off this week, Happy Birthday to Tom, who with James are regular supporters, Blenheim looked fine but there was no escape from cricket! In your absence we were cheered by Anthony and Phil so did not feel totally abandoned. See you and the rest soon.